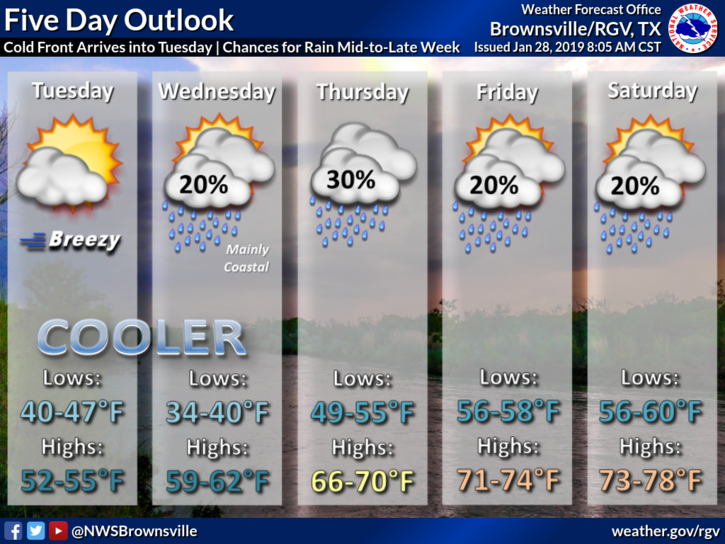 A cold front will keep the temperatures in the 50s across the Rio Grande Valley on Tuesday, according to the National Weather Service in Brownsville. Expect breezy and mostly sunny conditions. South Padre Island will only reach 53 degrees while Brownsville will see a high of 55. McAllen can expect to see a high of 57. Lows Monday night into Tuesday morning will be in the 30s. Looking ahead, the Valley will see cooler temperatures through midweek before a warming trend this weekend, when temps are expected to be in the upper 70s. Wednesday’s highs will range between 59 and 62 degrees.